After successfully tested four to five major beta versions of iOS 6.1 Firmwares of mobile operating system, Apple has now officially released the Final iOS 6.1 Firmwares for iPhone 5, iPhone 4S, iPhone 3GS, iPad 4, iPad 3, iPad 2, iPad Mini, iPod 5G Touch and iPod 4G Touch publicly worldwide with several new software and hardware improvements and bug fixes so if you're still running an old iOS Firmwares on your iPhone, iPad and iPod Touch devices than you should Download, Install and Upgrade to the Latest iOS 6.1 Official Firmware available for all iPhone, iPad and iPod Touch devices. 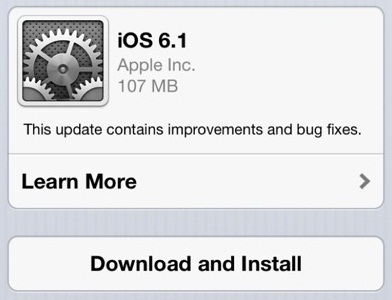 If any iOS device user wants to update/upgrade their current/old iOS firmware to the latest iOS 6.1 firmware than they can do it through OTA (Over-the-Air) automatic wireless process by simply using their iDevice and going to Settings > General > Software Update or if any iOS device user have its own iOS Dev Center Account than they can Get iOS 6.1 IPSW Firmwares from iOS Dev Center Website and iOS device users can also Upgrade, Install and Download Official iOS 6.1 IPSW Firmwares for iPhone 5, iPhone 4S, iPhone 3GS, iPad 4, iPad 3, iPad 2, iPad Mini, iPod 5G Touch and iPod 4G Touch via Direct Links through iTunes Manual process available below. LTE support for more carriers (complete list of supported carriers at www.apple.com/iphone/LTE/). Purchase movie tickets through Fandango with Siri (USA only) and many more new features and improvements. iDevice users can download, install and upgrade their old iOS Firmwares to the latest iOS 6.1 Final IPSW Firmware from following official mirrors by using iTunes method.